Cheddar Bay updated 2013 rules, intro. Clearinghouse for Browns takes and Cheddar Bay. Home » College Football » On the inherent unfairness of sanctions. On the inherent unfairness of sanctions. Who paid for the sins of Reggie Bush and Pete Carroll? Fourth rounder, Matt Barkley. Guest post today from an Oregon Duck fan we met on through our friends at FishDuck, Don Gilman. He approaches the NCAA question from a different angle:  rather than debate the future of mega-conferences and the corrupting influences of TV and sponsor money, he just looks at the problems of how sanctions are administered, whether the right people are punished, whether the current system serves as a deterrent. With respect to Johnny Manziel:  we (seem to) have a high celebrity profile college athlete who wants not for money and who is cognizant of the current rules and who knows the damage he can cause to his school, friends, teammates. And he pissed on all of them. The righteousness of the rules themselves is a separate issue. Manziel (seems to have) willfully broke(n) NCAA rules, rules all other athletes must abide by, and on a large scale. The point Gilman makes here is that the probable recipients of his punishment will be his current teammates and isn't that unfair? Don’t expect Chip Kelly to lose sleep over Oregon sanctions. Sanctions. You either love them or hate them. We love them when the teams we hate get leveled by them, and hate them when teams we love get the same treatment. Ironic, isn’t it? But there is something inherently unfair about the way sanctions are carried out, no matter what team we are rooting for. I began thinking of this a few years ago when USC was still in the midst of a bowl ban, and thought of it some more last year while watching Matt Barkley and the Trojans in their downward spiral. Now, a lot of why they were losing had to do with poor coaching and a seemingly lackluster attitude about playing a full four quarters, but there was also no doubt in my mind: the lack of scholarship players was also taking its toll, especially in the latter portion of the year when injuries and fatigue were wearing players down. Last year while watching Barkley play (yes, I am admitting I felt badly for a Trojan), I was struck by the unfairness of the punishments the NCAA seems fond of dishing out. Just like Marcus Mariota and De’Anthony Thomas, Barkley was and is a class-act, a good guy, an honest guy, someone who really didn’t deserve to be punished by the bad behavior of someone else. But it was Barkley — and not Reggie Bush or Pete Carroll — who was paying the price for their mistakes. Just like Mariota and Thomas, not to mention all the other Ducks players, would have paid the price for the mistakes of Chip Kelly and Willie Lyles had Oregon gotten whacked harder. 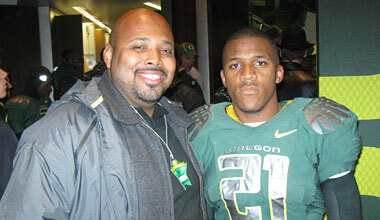 Will Lyles, recipient of $25,000 in ‘scouting fees’ from the U of O with LaMichael James in 2009. Think Chip Kelly is going to lose sleep over the now minor sanctions leveled against U of O? Think again. I can’t imagine the ol’ Chipper is going to do more than shrug his shoulders and move on with his life. While Lyles’ reputation has certainly been torn apart, there is nothing of direct consequence that is going to happen to him, and he certainly won’t be losing any sleep either. So, just like USC and Matt Barkley, the brunt of the punishments will fall on honorable young men who have done nothing to deserve it. Now, there is one entity that does deserve some punishment, and that is the university itself. Sure, a bowl ban does affect the University, the tarnishing of its reputation will be detrimental to their future ability to lure recruits — but overall, life will continue pretty much the same as it always has for U of O. It will shrug off the punishments like water off a Duck’s back — sorry, I couldn’t help myself. Also, coaches should not be able to skip town, sign a multi-year, multi-million dollar contract while the university, and more importantly, the players, pay the real price. Coaches should pay a heavy financial fine, even if they have left the university. The NFL should enter into an agreement with the NCAA so that if said coach does leave, their salary will be docked. Even better, by creating regulations that prevent guilty parties from gaining employment from the NFL, they can force coaches like Kelly and Carroll not to shirk responsibility. Think about where Barkley’s draft stock was before last year’s disastrous season. He was speculated to have been possibly the top draft pick overall if he had foregone his senior season at USC. Yes, I know it was not just the lack of scholarships that caused USC’s swoon last year, but there is also little doubt that they did have a substantial effect on their overall play. Now Barkley might not even go in the first round. Barkley ended up being drafted (ironically) by Kelly and the Eagles in the fourth round. From possible No. 1 draft pick to No. 98. That is a fall of epic proportions, and a good deal of that is due to sanctions that he had nothing to do with. The point is this: If we are going to create punishments that really are fair to players and effectively punish the wrongdoers in question, let’s do it in a manner that puts the hammer down where it really counts: in the pocketbook. Fine the University a huge amount of money, and make that fine so large that it makes all universities in the nation take notice. Fine the coaches a huge amount of money, and make that fine inescapable. Forget bowl bans and scholarship reductions. Keep the show-cause penalties, but beyond that, find a way to work a deal with the NFL that keeps coaches from bailing, scot-free, from the schools they just screwed over. Yeah, I am talking to you Chip Kelly, and you Pete Carroll. It’s past time that there were consequences for coaches who don’t seem to want to pay the piper. I know that none of these changes are likely to happen anytime soon. Too many traditions, too many entrenched attitudes, too many fingers in the pie to upset the apple cart. This is just one sport fan’s wish for a more equitable solution to an inherently unfair way to resolve wrong-doing. By mburgermeister in College Football on August 5, 2013 . Yes I,and I would think many others would like the axe to fall only on who deserves it,wether coaches or players,or college. Yet as unfair as it looks many times,I am not so sure it is excluding the coaches who seem to get away from all sanctions if they change where they coach. Still you can’t tell me no one tells the college administration what happens in the sports programs so the colleges know and at least silently condone the problems by doing nothing. Can’t tell me most in the admin or on the football team didn’t know what was happening at OSU, same goes for the media in Columbus. So I would say most times players know when others break the rules a lot when it would lead to sanctions and screwing their own future. Therefore the playters have to make a choice is their future worth less than being honest and to use a popular term snitching,or do they only have that future if they say nothing. If they say nothing they are guilty if they know rules are broken,but they better switch schools if they come clean. When I was in high school I made a choice to take the blame for a lot of things I didn’t do or admit what I did and give names(since the other stuff involved theft and vandalism that neither I nor my parents could afford to pay back. I was kicked off the team and suspended,those I named were legacy students and had older brothers still in school some of whom were stars on varsity they got no punishment,so was that fair? That’s my point the popular or important atheletes will never get punished same with the coaches. On a differret topic altogether why is the 5 year old from family night a national story? I am only annoyed because that’s the only thing I am seeing in national news. i’ve managed to avoid viewing the 5-year-old’s clip though i do see that @nfl tweeted it out. one interesting thing about this post is that it caused some internal debate at the oregon site because it skewed negative toward the school itself. i’m with gilman and do not think the coaching staff should bear the burden of sanctions alone. a college creates a culture of ‘win at all costs’ or it doesn’t.